Newly promoted sergeants, get ready for new education requirements to make it to staff sergeant — or any rank beyond. The Corps is rolling out a new professional education requirement for enlisted Marines that will need to be completed before making it to any new rank, all the way up to master gunnery sergeant. The program is called Regional, Culture and Language Familiarization, or RCLF for short. It takes the globe, carves it up into 17 different sections, and assigns to Marines the cultures and languages associated with each. New lieutenants have been doing this since 2008 and new warrant officers since 2010. The goal is to get officers and enlisted personnel across the force up to speed on different parts of the world so no matter where Marines are sent, they’re ready. They can teach their comrades about what to do — or not to do — when they get in-country. 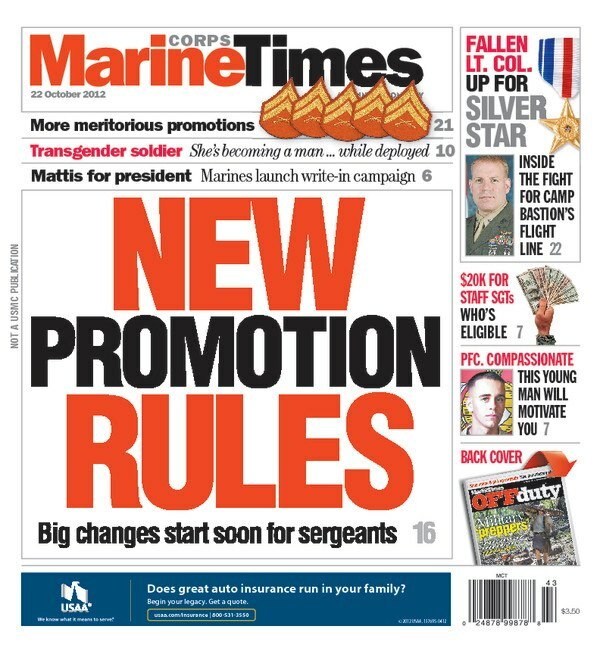 Check out the new issue of Marine Corps Times for the details on how it will work and what you’ll have to do. Also in this issue: Dan Lamothe reports from Afghanistan on the details behind the Sept. 14 attack on Camp Bastion, including talk of the Silver Star for the commanding officer, Lt. Col. Christopher Raible, who led the counterattack against the insurgents. A former grunt who thinks Washington politics need a shakeup has started a write-in campaign to get Gen. James Mattis into the White House. And corporals will see the number of spots open for meritorious promotions double.